Hobie Forums • View topic - Motorized PA, the wave of the future. Motorized PA, the wave of the future. Post subject: Re: Motorized PA, the wave of the future. Memory Maker, try putting your mirage in backward. I am not sure how the PA's rudder will handle it as it does put a fair amount of pressure on the rudder and all my experience has been with an Adventure. I used a small wedge under the rudder handle to lock it as it does use up one hand to hold he rudder in current. The slightest turn on your rudder can see the water pressure snap your rudder around to full lock in an instant, so you need to hang on tight. You cannot go fast as the same will also happen, slow and steady is the key. Having the rudder at the "front" also gives you a lot tighter turning and manoeuvrability is increased dramatically, really good for moving around structure while you guide your line and lure past as you go. It does take a fair bit of practise to get used to (well I found it to anyway) but the bonuses were worth the effort. It's a great way to fish. I love trolling in reverse, specially if the are surface lures because you get to watch the explosive catch and fish jumping, and jigging plastics on the bottom as I slowly move around, you have so much more control, your lure is in the water longer and you can move amongst the structure rather than continuously casting over an area. 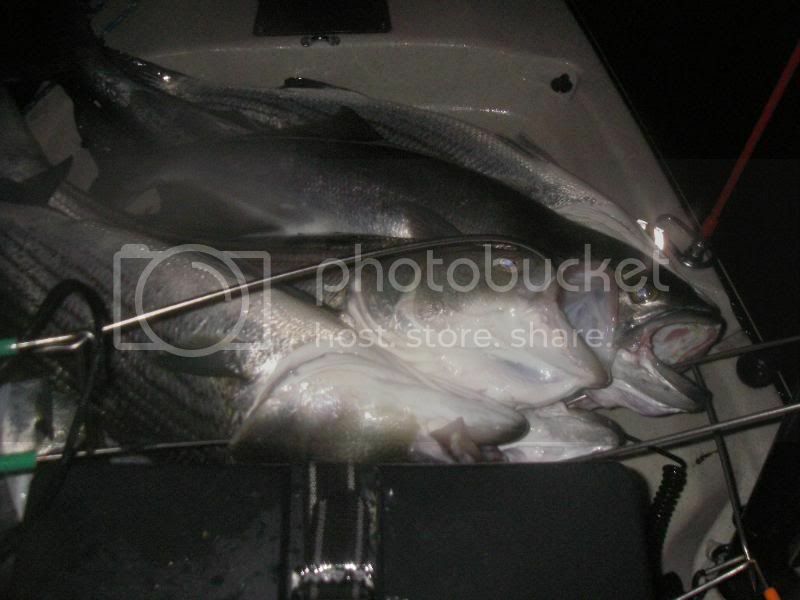 Damn Sifisto those are some nice looking stripers. You are THE MAN!! I can't wait to join you on the Dark Side with my motorized PA.
Angler at $999? Am I looking in the wrong place? I'm going to have to wait a while to be able to swing that one. I want one, but it ain't going to happen no time soon. Jimmy D , I have caught so many fish on that lure I have bumped up my collection to over twenty of them. Great deals on ebay, but none in the 155 american shad sinking. I bought several in the 182 sinking american shad, but they are hard to troll without catching bottom fishing in the 15' range. This lure is expensive, but when you're catching many big fish with it; it then becomes a very valuable tool. 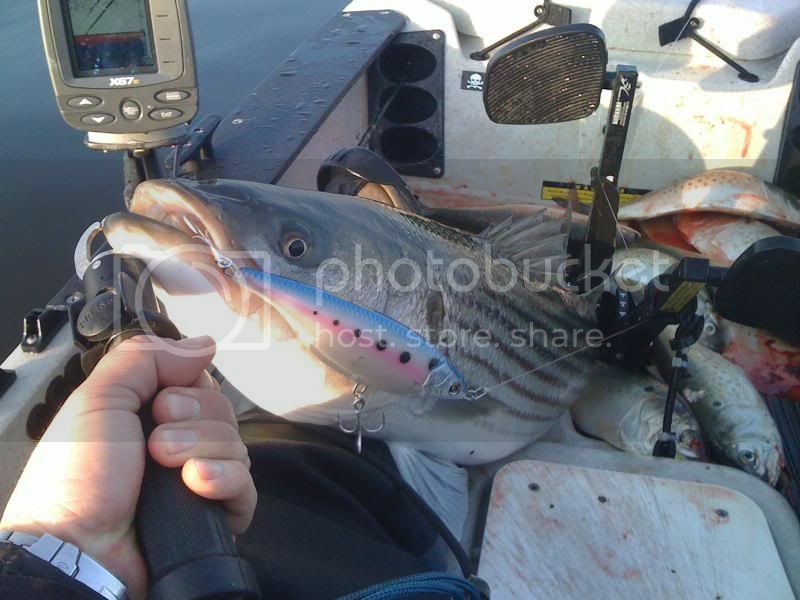 The swimming shad in white 190 is another striper hot plug. Every year it's something new, for now this lure is on fire. the company was just sold, so what's out there is what you're stuck with. I found out early and bought up everything. Good luck in your search. Everytime out in my motorized PA I feel sorry for those stuck in the old way. I dumped $2500 into my system, and you get what you pay for. Remember the bassyak system doesn't come with batteries. If you want to catch oodles of fish, there needs to be an investment at some point. If you nickle and dime yourself the results will surely show. I have no complaints, and my fish #'s have soared. Try finding bunker paddling around all day. With a motor it's child's play. The above pictures are old, it's usually always a three fish day with the bonus tags. What are you waiting for???? 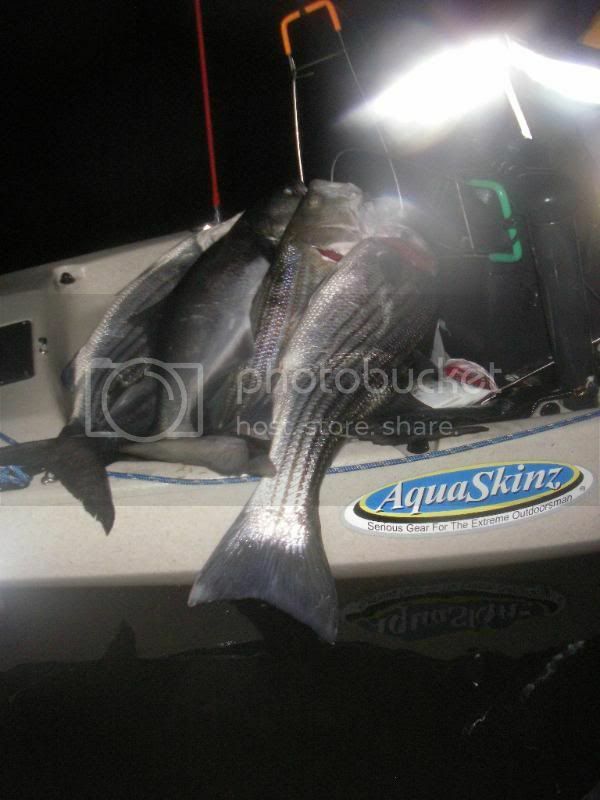 More Bassyak laden bonus tag stripers. Covering more ground in less time proves success time after time. Bonus tags are an option, but I go through a lot of fish in my house. Even the heads are used, the stomach contents are used again as chum(you got that from me). Not much left in the way of waste. Here are some pics to get you thinking. [youtube] [/youtube] Night time fishing, where the masses sleep and the hunters catch. It's like this most of the time, come to one of my seminars and learn what you need to know. It's all good. MJ. Man, M.J.!!! You're doing some serios damage!!! 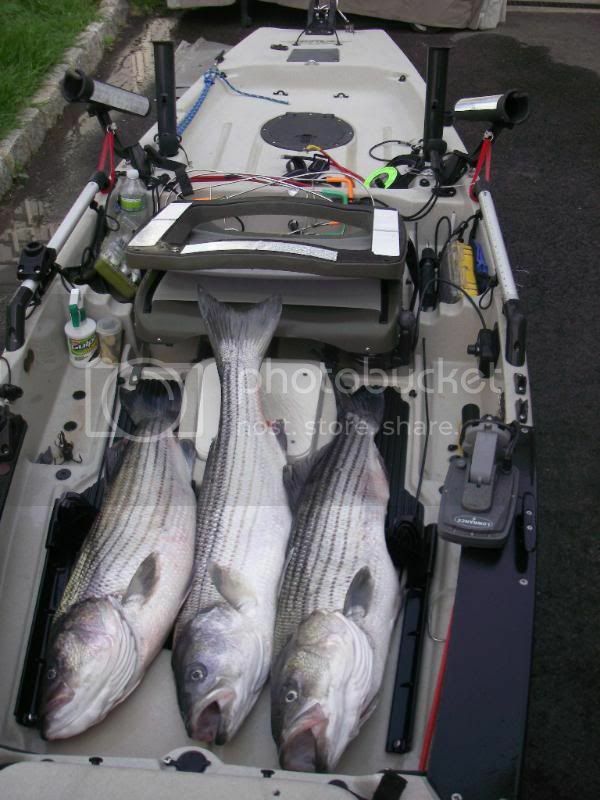 Them some nice stripers there....how many did you throw back? That's what I love about where I live....no limit on stripers....average catch may be in the 20s - 30s....and they're always fun to catch. I threw back everything past three fish, since I'm allowed a third fish with my $2 bonus tag. Twenty fish a day is not uncommon, and the pictures you see are just normal days for me. Went out yesterday and covered some serious ground using the bassyak system. I was tossing plugs, trolling, fan casting, then chunking up fish. I'm back to cleaning fish after typing this. I don't even use the mirage drive anymore, it gets stored in my front hatch for emergency purposes much like the paddle that's in there. I finally found a use for that black Hobie mirage drive plug. It works great, and frees up my leg room. Seen two other motorized yaks yesterday, both were unregistered; hate to see them get the $500 fine....but the motorized yaks are coming. Nice....I'm guessing those are Salt Water then. It's interesting to read the stories of other people....such as a limit of 3 with a $2 tag. 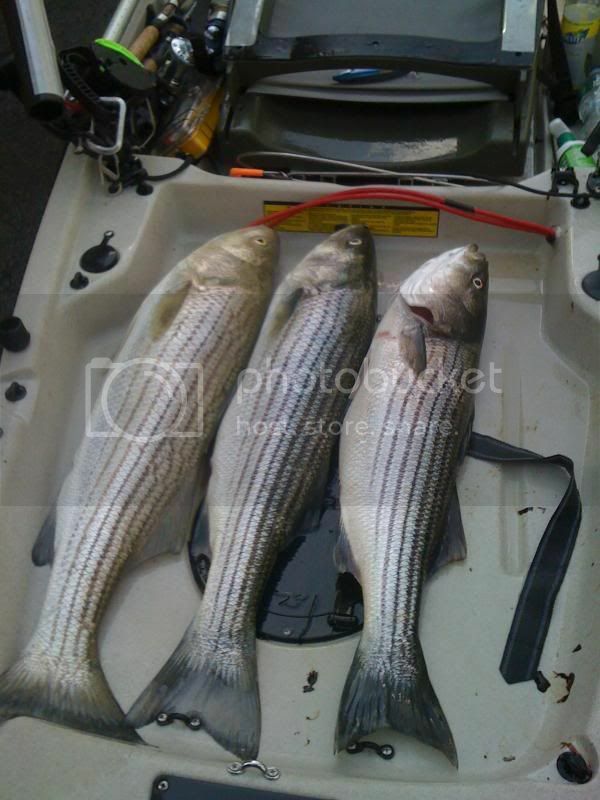 In our freshwater lake, stripers are the one thing there is no limit on....It's almost to a point of not even needing a fishing license for stripers Nice fish regardless. The only thing I wonder now is since you've gone completely powered with the bassyak system, would you opt for a different kayak besides the PA? Not knocking the PA or anything. Oh, one more thing. How long does the motor last? Some areas where I am would be an 11 mile trek to get through a canyon, bay, etc. I,m done thinking talked to Steve at Bassyaks today . It,s going to be a long 3 weeks When is the next seminar?